The EM-Tec gripping stub and stub based vise holders are useful to grip and hold SEM samples without much need for sample preparation. Ideal for cross-section and edge-on imaging. The comprehensive selection of this type of cost-effective gripping and vise type holders is compatible with SEMs using pin stubs (FEI, Zeiss, Tescan, Phenom, Aspex), SEMs using M4 thread (Hitachi and EM-Tec SEM stage adapters) and JEOL SEMs. EM-Tec GS24 gripping stub holder with clamping plate to hold samples or tissue up to 4mm thick. Sample is held by the clamping plate which is pushed with set screws. Also useful for holding tissue for dehydration and CDP processing. 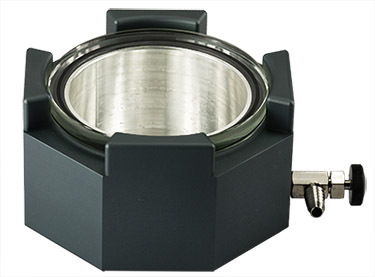 Holder size is 24x13x12mm; fits in any SEM using standard 3.2mm pin stubs. Ref: McTurk, G., Bulman, S., Ocklefors, C.C. Journal of microscopy 127,233. 1982. 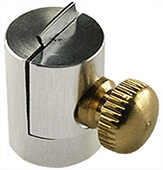 EM-Tec PS4 mini pin stub vise clamp for sample thickness from 0-4mm. The sample is held vertically with a small set screw. Most effective way to study cross sections of thin samples. Holder size w/o pin is Ø12.7x7.2mm. EM-Tec PS44 quadruple pin stub vise clamp for 4 samples with 0-4mm thickness. The samples are held vertically with 4 small set screws. Most effective way to study cross sections or thin samples. Holder size w/o pin is Ø25.4 x 7.2mm. Standard pin. EM-Tec PS6 mini pin stub split vise clamp for sample thickness from 0-6mm. The sample is clamped between the two mini vise clamps. The split vise jaws are closed by an allen screw. Closed split vise diameter is 12.7mm; when opened it is 19x12.7mm. EM-Tec PS9 mini split mount vise clamp for sample thickness from 0-8mm. The sample is clamped between the two vise jaws of the split mount. The split mount vise jaws are closed by two allen screws. Closed split mount vise dimensions are Ø15x10mm; when opened 23x15x10mm. EM-Tec PS7 mini pin stub dual slot vise with two slots of one mm wide. Ideal for holding thin wafer pieces samples for cross section imaging. Samples are clamped by set screws. Holder size w/o pin is Ø15x6mm. EM-Tec PS12 pin stub vise clamp for sample thickness from 0-12mm. The sample is held vertically with a set screw. Most effective way to study cross section of thin samples. Holder size w/o pin is Ø25x6mm. EM-Tec GS24 gripping stub holder with clamping plate to hold samples or tissue up to 4mm thick. Sample is held by the clamping plate which is pushed with set screws. Also useful for holding tissue for dehydration and CDP processing. Holder size is 24x13x12mm; M4 threaded hole in base. Ref: McTurk, G., Bulman, S., Ocklefors, C.C. Journal of microscopy 127,233. 1982. EM-Tec HV5 mini sample vise clamp for sample thickness from 0-5mm. The sample is held vertically between the vise jaws. The vise jaws are tightened by a brass thumb screw. Holder size is Ø12.2x17mm. EM-Tec HS6 mini M4 cylinder stub vise clamp for sample thickness from 0-6mm. The sample is held vertically with a small set screw. Simple and cost-effective way to clamp cross section of thin samples. Holder stub size is Ø15x10mm xM4. EM-Tec HS9 mini split mount vise clamp for sample thickness from 0-8mm. The sample is clamped between the two vise jaws of the split mount. The split mount vise jaws are closed by two allen screws. Closed split mount vise dimensions are Ø15x10mm; when opened 23x15x10mm. EM-Tec HS15 M4 cylinder stub vise clamp for sample thickness from 0-16mm. The sample is held vertically with a set screw (multiple lengths are supplied). Cost effective and practical small vise clamp base on the stub size of Ø25x10mm xM4. EM-Tec HS7 mini pin stub dual slot vise with two slots of one mm wide. Ideal for holding thin wafer like samples for cross section imaging. Sample are clamped by set screws. Holder size w/o pin is Ø15x6mm. EM-Tec JS4 mini cylinder stub vise clamp for sample thickness from 0-4mm. The sample is held vertically with a small set screw. Most effective way to study cross section of thin samples. Holder stub size is Ø12.2x10mm. EM-Tec JV5 mini sample vise clamp for sample thickness from 0-5mm. The sample is held vertically between the vise jaws. The vise jaws are tightened by a brass thumb screw. Compatible with holders for the Ø12.2x10mm JEOL stub with a height of 17mm above the stub. EM-Tec JS12 cylinder stub vise clamp for sample thickness from 0-12mm. The sample is held vertically with a set screw (multiple lengths are supplied). Cost effective and practical small vise clamp based on the stub size of Ø25x10mm.